It's Real: How did I do? You all know I cut my hair a few months ago. Well for some reason my hair grows like weeds in the warm months. 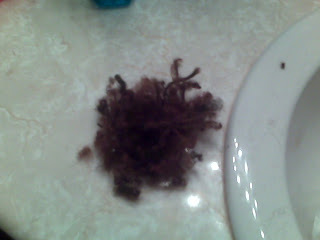 I was so frustrated with it the other day I grabbed the scissors and began cutting it myself. I have been cutting it daily for the last week. I wanted my crop do back especially since it's hot as hell here in Atlanta. I don't want any hair on my neck. So check out the pics and tell me what you think. Please keep in mind this was the first time I've ever cut my own hair. The pic with me in the green is the final cut day...lol. I think you did a great job! Your locks are beautiful! Looks like you got skillz chica! 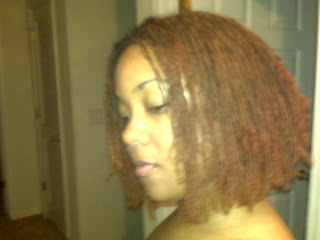 I love the cut and the color...how fun to have most all one length. I fear I will never have that...never had it with loose hair either though. Anyway love the look...you are flyy! Great job! I agree with the sista who said that she can't wait till her hair is too long! LOL. The cropped look is cute on you. Keep up the good work. I think you did a really good job. I love the pics in May with the curly ends. I can not wait until my hair grows that long! BTW I linked you to my blog hope you don't mind. Okay...you will cut mine when I get to that stage. Ummm Hmmm. Yep. Your hair looks absolutely gorgeous! 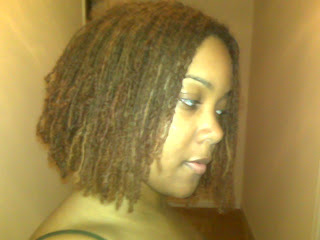 I'm in the transition stage right now...trying to grow another inch before Sisterlocks. 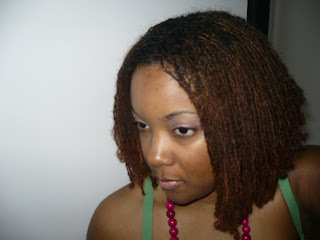 I can't wait to get my Sisterlocks! You did an excellent job!!! Please hit me up and let me know who your sisterlock consultant was (if she still does her thang) and also what natural salon u visit (ere now and then). I think I wanna join the sl club LOL. You did a great job...I am so afraid to deviate from my normal routine!!!! I so have loc envy right now..
Looks like a professional job to me. Kudos for being so brave to even attempt such a feat. Do you have any suggestions for a Sisterlock survival kit? Are there any products/items you wish you had on hand when you were first loc'd (e.g., SoftSpikes, microfiber towel, styling products)? Please let me know. I want to be sure I'm prepared for proper styling and maintenance immediately after my locking sessions. That looks great, soror. I am loving the pink n green look as well! I appreciate all of your comments! Journeii - I don't mind at all! Happiest Nappy - LOL...I don't think you want these hands in your head! Shalilac - send me your email address and I'll send you the info. Medivine - I'm going to be totally honest with you...I just used plain ole shampoo and water and maybe a little rosemary oil on the scalp. No survival kit here. No accessories or anything. And of course going for my retightenings every 4-6 weeks. 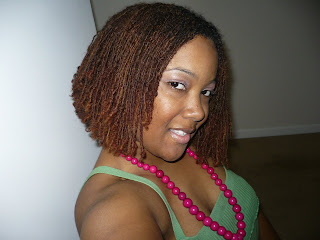 Your locks look great and I love the simplicity of your regimen! Okay, I see I am not the only one who wants to cut there SL!! Your cut is so cute. I will have to do inch by inch!! I love the cut and You did a superb job Alright Now! great, great, great! i don't know how you managed cutting the back of your hair, but it looks really great! You did a superb job! I notice that your ends are a little fuzzy so have you encountered a little unraveling since your cut? i keep seeing more and more bobs...lovely..and great job!! !keep rockin that salmon pink and apple green. I think the bob is fierce. You did a great job. And yes it is too darn hot in the ATL. The crop do looks so cute on you. Love your hair,the colour and cut, suits you down to the ground girl! OMG, your hair cut is hot. You've got the cutest nose too. I'm in the Atlanta are and would like to get Sisterlocs. Please share your consultants name and contact information. I've been advised not to let "just anyone" do them. Your hair looks great and I love the cut and color. Thanks! don't know if anyone still keeps up on this blog but, i would luv to know your hair care regimen from your april 09 pictures, it's beautiful! you can hit me up at chanceforzen.com --my email is on there or feel free to just drop a comment! I'm addicted...I had to go shorter!